Although it was built close to 700 years ago, the Casa Grande remains one the tallest structures in the town of Coolidge, Arizona. Padre Eusebio Francisco Kino, a missionary and one of the first Spanish visitors to the site, coined the name Casa Grande, which means “great house” or “big house” in Spanish. Numerous historic accounts of Casa Grande record the wonderment of early visitors at seeing this four story building rise over 35 feet from the desert plain. 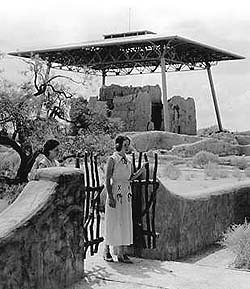 The Casa Grande is probably the most significant surviving example of Hohokam building techniques and architecture made from caliche, a concrete-like mixture of sand, clay, and calcium carbonate (limestone). The four southern tribes of Arizona, as well as some pueblo tribes, claim Hohokam ancestry. The term Hohokam is derived from a word used by the Akimel O'odham of Arizona meaning “those who have gone.” For over 400 years, the Hohokam occupied large settlements close to the Salt and Gila rivers in central and southern Arizona. They traded extensively, obtaining many items from as far away as the Atlantic and Pacific coasts of Mexico. To grow crops in the arid Sonoran Desert, the Hohokam constructed and maintained large and extensive irrigation system, without the use of metal tools. During the Classic Period, from approximately A.D. 1100 to 1300, the Hohokam built large, rectangular platforms of mounded earth. Some archeologists believe that the large structures indicate that civil and religious hierarchies existed. It was during the later part of this period, that the Hohokam built Casa Grande. Situated only one and a half miles south of the Gila River, Casa Grande is the largest and best preserved of the Hohokam big houses. The base of the structure is approximately 60 feet long by 40 feet wide. Close to four feet thick, the walls have resisted hundreds of years of wind and water erosion. Holes in east and west walls of the edifice near the top of the structure align with the sun at the summer solstice, the fall and spring equinox, and with the moon when it arrives at a certain point every 18.61 years. Casa Grande was influential to the creation and implementation of laws to protect archeological sites in the United States. As one of the most spectacular and fragile archeological sites in the American southwest, Casa Grande demonstrated the immediate need for the protection of archaeological sites. In particular, the Hemenway Southwestern Archaeological Expedition garnered public attention and concern for its preservation. Casa Grande was one of the first recipients of federal protection when President Benjamin Harrison proclaimed the 480-acre federal archeological reservation in 1892. In recognition of the structure's fragility, preservationists put a roof over the big house in 1903. The struggle to protect Casa Grande represented some of the earliest activism by archeologists, other scholars, and preservationists to preserve archeological sites, and led to the creation of the Antiquities Act of 1906. On August 3, 1918, President Woodrow Wilson used his powers under the Antiquities Act to establish Casa Grande Ruins as a National Monument to protect “the prehistoric ruin known as Casa Grande…ruins of the ancient buildings and other objects of prehistoric interest” (Proc. No. 1470). Today, nearly 100,000 people come to Casa Grande Ruins each year. Visitors can go through the interpretive museum and take a tour of the Great House and the surrounding Hohokam compound. From an observation platform, visitors may also view a Hohokam ball court and the remains of another residential compound, one of several found in the area surrounding Casa Grande.